Geiger takes its responsibility for managing security and compliance very seriously and has established policies, processes and controls designed to ensure the protection of your Personal Data, including a variety of security strategies intended to prevent unauthorized access to your Personal Data. These policy statements and security strategies are explained and described on our website at www.geiger.com. This policy does not apply to the practices of companies that Geiger does not own or control, or to people that Geiger does not employ or manage. Geiger collects personally identifiable information when you register for a Geiger account or when you use certain Geiger products or services. 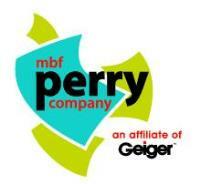 Geiger may also receive personally identifiable information from our business partners. When you register with Geiger, we ask your name, email address, zip code, billing address and phone. Once you register with Geiger and sign in to our services, you are not anonymous to us and additional verifications steps will be taken. Geiger also automatically receives and records information on our server logs from your browser including you IP address, Geiger cookie information and the page you requested. Geiger uses information for three general purposes: to customize the advertising and content you see on our pages, to fulfill your request for certain products and services, and to contact you about specials and new products. We store information that we collect through cookies, log files, and clear gifs to create a “profile” of your preferences. We tie your personally identifiable information, and your purchasing history, to information in the profile, in order to provide tailored promotions and marketing offers and to improve the content of the site for you. Geiger will send personally identifiable information about you to other companies or people when: We have your consent to share the information; We need to share your information to provide the product or service you have requested; We need to send the information to companies who work on behalf of Geiger to provide a product or service to you. (Unless we tell you differently, these companies do not have any right to use the personally identifiable information we provide to them beyond what is necessary to assist us. ); We respond to subpoenas, court orders or legal process. Geiger uses web beacons to access our cookies within our network of web sites and in connection with Geiger products and services. We may provide you the opportunity to participate in contests or surveys on our site. If you participate, we will request certain personally identifiable information from you. Participation in these surveys or contests is completely voluntary and you therefore have a choice whether or not to disclose this information. The requested information typically includes contact information (such as name and shipping address) and demographic information (such as zip code). We use this information to notify contest winners and award prizes, to monitor site traffic or personalize the site (in the case of anonymous information collected in surveys), or to send participants an email newsletter. By completing the review, I authorize my product review and testimonial to be used on Geiger’s websites and in print to help others evaluate its products and services. I grant Geiger authority to only show my first name, state of residence, industry demographics, testimonial comments, and any photos (optional) that I may provide. I waive the right to approve the written copy in which the testimonial appears, and I will receive no renumeration for its use. Affirming I am at least 18 years old, I give consent for the use as indicated. If you choose to use our referral service to tell a colleague about our site, we will ask you for your colleague’s name and email address. We will automatically send your colleague a one-time email inviting him or her to visit the site. Geiger stores this information for the sole purpose of sending this one-time email and tracking the success of our referral program. Your colleague may contact us at datasecurity@geiger.com to request that we remove this information from our database. Your Geiger Account Information is password-protected for your privacy and security. In certain areas Geiger uses industry-standard SSL-encryption to protect data transmissions. Geiger may edit this policy from time to time. If we make any substantial changes we will notify you by posting a prominent announcement on or pages. Personal Data we collect may be stored and processed in the United States or any other country in which the entities represented by our affiliated and subsidiary companies or Business Partners maintain facilities. We ensure that such storage and processing is subject to appropriate levels of protection to safeguard your Personal Data. Further, Geiger ensures that for any transfer of Personal Data to a country outside the EU/EEA it has adequate safeguards in place for the transfer of personal data to third countries. These safeguard may include agreements incorporating the EU standard contractual clauses. Geiger evaluates and responds to reports of incidents that might involve unauthorized access to Personal Data. If we become aware that Personal Data has been compromised or mishandled, we report any such action or activity to you in accordance with prevailing legal and/or contractual requirements. Notification of a Data Breach will be given within 72 hours of discovery. In addition, we may share Personal Data with Business Partners that help us or our affiliated and subsidiary companies to carry out transactions you request, or to customize, analyze and/or improve our communications or business relationship with you. We will only share Personal Data with Business Partners who share our commitment to protecting your Personal Data. Except as described above, we will not disclose Personal Data to third parties for their own marketing purposes unless you have provided consent. We use outside suppliers and shipping companies to fulfill orders. These companies do not retain, share, store or use personally identifiable information for any other purposes. You may choose to receive or not receive marketing communications from us by indicating your preferences. If you would prefer not to receive future marketing communications, or wish to change or modify information previously provided or delete inaccuracies, or to request deletion of personal data, please provide a written request to datasecurity@geiger.com. Upon receipt of your request, your information will be updated as soon as possible, but no later than ten (10) days after our receipt of your request. We will respond to all requests for access to your Personal Data within 30 days. We will retain your Personal Data for as long as your account is active or as needed to provide you services and as necessary to comply with our legal, regulatory or compliance obligations. Even if you opt out of receiving marketing communications, we may still communicate with you in connection with servicing your account, fulfilling your request, or administering any promotion or any program in which you may have elected to participate. Please see our terms of service for children’s data and eligibility. When we use your Personal Data in connection with a product or service, the data will most often be encrypted both in transit and at rest. When we do engage third party providers for various services, including cloud hosting services for certain aspects of our offerings, we rely on the public policies and protections of those globally available services for the protections we apply to your Personal Data.